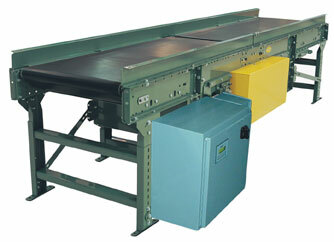 GapLogix is designed to control “Gapper-L” model conveyor. 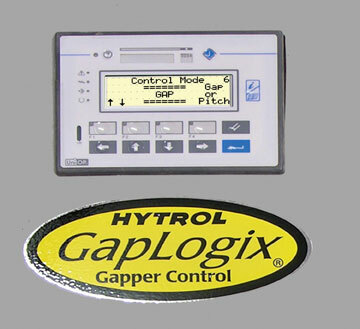 GapLogix has been installed in a number of systems to control gap or pitch. Modular controls for specific, complex areas of a system provide a complete machine and allow easy integration into any system. Speed of installation, ease of setup, ease of integration, flexible and configurable operation, and tested, complete machine performance are some of the goals during development of control products. GapLogix can be used to feed pusher style sorters, weigh scales, print-and-apply applications, or any other application requiring a specified pitch from leading edge to leading edge on product. All of this is done regardless of product length. By reducing wasted space, GapLogix can optimize performance of the system and allow better throughput rates to be achieved at lower speeds. This reduces the rate of wear on the equipment, thus extending its life. Slower speeds also present less impact on the product. GapLogix can be easily integrated into any system. Only a 24VDC “Run Signal” is required. A “Fault Status” is provided for diagnostics. An accumulation conveyor is required prior to the Gapper to buffer product during GapLogix’s operation. GapLogix directly controls the accumulation on this conveyor dynamically while making adjustments between products. Required power is 460V AC. Four independent gap or pitch settings can be selected via discrete inputs to allow the required gap or pitch to be changed if requirements change. This feature was useful in one particular installation where the Gapper conveyor fed three print-and-apply applicators. The gap between products was dynamically selected based on the operational status of the 3 applicators. There are several configuration parameters provided on the screen to optimize the Gapper’s performance to the system’s unique product mix. The discharge speed of GapLogix can be set on-screen to match the downstream conveyor that it is feeding. Consideration should be given to the stability of the system’s unique product in relation to the desired speed. If in doubt, contact us to provide a sample product for testing. A video can, on request, be made of your product’s performance on Hytrol conveyors. Hytrol conveyor product testing and the video are always free - contact Cisco-Eagle for details. These products are modularly designed to compliment the overall system controls by providing a solution for the critical, complex area within the system.